State officials from the Maine Department of Transportation and Maine Department of Inland Wildlife and Fisheries were invited to speak at a forum here Thursday night by state Sen. Troy Jackson, after the lawmaker received several phone calls from “emotional people” regarding an uptick in moose accidents in the area. FORT KENT, Maine — State officials from the Maine Department of Transportation and Maine Department of Inland Wildlife and Fisheries were invited to speak at a forum here Thursday night by state Sen. Troy Jackson, after the lawmaker received several phone calls from “emotional people” regarding an uptick in moose accidents in the area. According to Maine DOT statistics, there have been an estimated 67 moose-related vehicular accidents in Aroostook County this year, with a majority of the accidents occurring on Route 11. While Thursday’s presentation was designed to give locals an opportunity to discuss their concerns and possible solutions with state officials, the conversation took an unexpected turn, according to Jackson. “What frustrated me was that different discussions broke out than for what the people were there to discuss,” he said Friday. The event started with Lee Kantar, a moose biologist with the Maine Department of Inland Fisheries and Wildlife, giving a presentation on how the department is counting and keeping track of moose and his citing evidence of findings that winter ticks and other parasites are a problem in the moose population. Then at one point, Hilton Hafford, one of less than 10 people in the audience, said that herbicides being sprayed by woods industry companies were driving the moose off their lands and causing them to congregate in smaller areas. That overpopulation in smaller areas, Hafford argued, was making them more susceptible to disease and parasites. 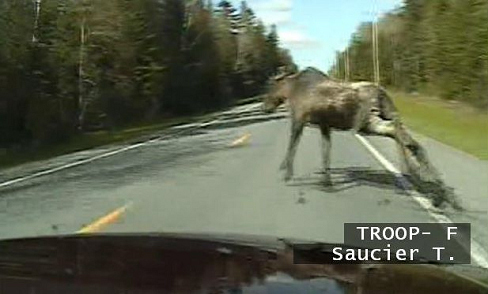 “Is the spray affecting the moose?” he asked Kantar. From that point, the conversation took another turn as audience member Jody Spears took the conversation in the direction of moose hunting permits and argued that legislators should lower the amount moose permits, if not end the hunt altogether. Jackson stressed that no one at the meeting was proposing increasing the moose hunt to reduce the number of accidents. By the end of the forum, a DOT representative was able to address the crowd and state that the agency would like to see the brush along the sides of some more problematic roadways cleared so drivers can better see moose in advance of one walking out in front of a vehicle. “[DOT will] look into whether there are some safety funds available to do projects like that to see if there is an opportunity to get clearing to see if that will help,” Bob Watson, the region manager for DOT, told the crowd. “I’m going to work with the DOT and if we need to get more funding we can try to do that,” Jackson said, referring to possible legislative efforts.